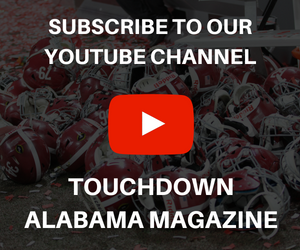 There is always good and bad in every endeavor, this is what the good, bad and ugly was in the eyes of Touchdown Alabama’s old man. As in all games, practices, scrimmages and more, there are good things, bad things and just outright ugly things. Overall fans were pleased just to see football, but coaches and aficionado fans saw much more. I wanted to watch the replay a couple of times to really see certain things over again, hence the delay of this article coming out. Let’s get the ugly out of the way so we can end on a positive note. 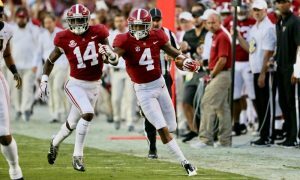 Nick Saban wasn’t the only only that noticed some generally sloppy mistakes like dropped passes. 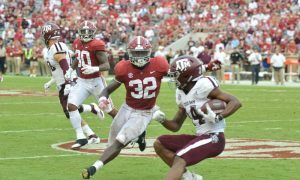 Jerry Jeudy alone was a poster child of good, bad and ugly. Dropping passes like a walk on washout one play, streaking for a touchdown on the next and not running a clean route on another play. Quarterbacks threw bad interceptions, the offense lines gave up a lot of sacks, the running game never got on track and defense backs gave up lots of big plays, some of which they never even knew the ball was in the air. Getting to specifics, every quarterback that threw a ball today but Blade Bolden threw an interception and Bolden quit while he was ahead only throwing one pass the entire day. 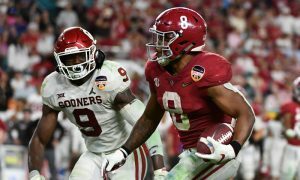 Alabama’s most experienced running backs the team will be counting on this fall averaged a dismal three yard and change rush per carry. And yes, Wills, the starting right tackle was out, but the offensive lines gave up 11 sacks and obviously when they weren’t giving up sacks, they weren’t blocking for running backs either. So that was the biggest ugly and the bad for the day. Now to end on a good note. Didn’t the defensive line play look good? Weren’t you impressed with the play of some of these freshmen? And when the quarterbacks finally got their picks out of their system, they started looking good. And once certain receivers got the drops out their systems, they looked good too. 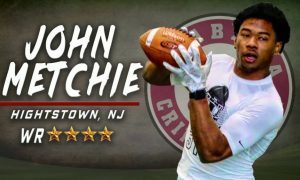 Every year a freshman jumps out of the crowd and just shows that he’s something to be reckoned with and this year it looks like it will be John Metche who was not only the game MVP for the jaw dropper for the day by going from relative unknown to a big WOW! factor. 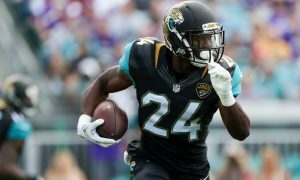 With two big studs leaving for the NFL from the running back corps and seeing the two big ones that were left struggling all game, it was good to see some new faces not struggle. Chadarius Townsend, a true athlete who can play running back or receiver seemed to have no problems a good 7.5 yards a carry, so the running game did have at least one bright spot. 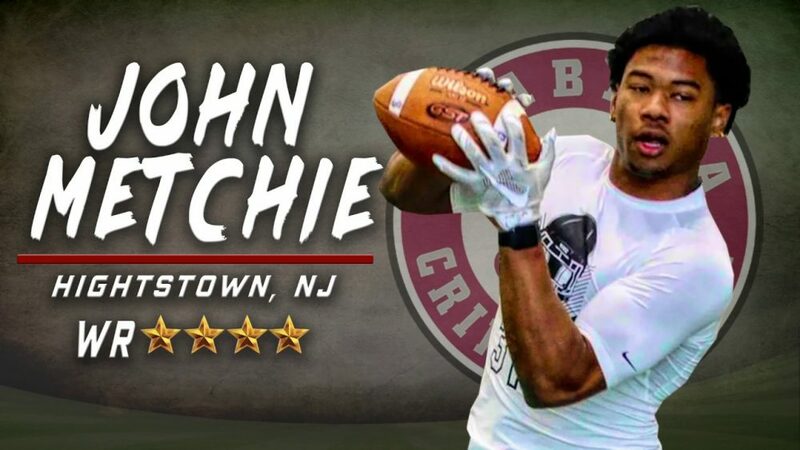 With Jalen Hurts leaving for Oklahoma, it was great to see Mack Jones put on the show we who really follow the team closely knew he could. 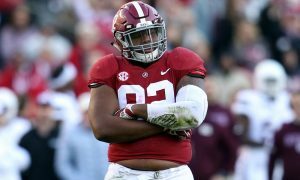 Jones showed that should Tua struggle or leave injured that the Tide is left with another gunslinger who can move the chains and light up the scoreboard. 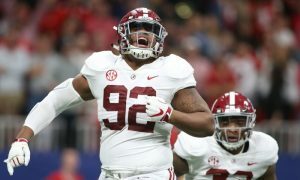 Jones may be the most underappreciated guy on the team for most of his time so far at Alabama, but his skills show he’d start at most other schools around the SEC. Having him as an insurance policy is huge for the Tide as you remember how important it was in the SEC championship game last season. Also, the special teams looked like they’ll add some years to the fans lives by not causing so many heart attacks when it comes to field goal kicking. The punts looked fine too, so maybe we can all just take a deep breath and accept that this area is fixed. Backup long snapper Hunter Brannon had the only boo boo of the day with a bad long snap that Mack Jones had to fall on, but since Bama has gone years without a bad long snap in a real game, we can overlook that mistake. Lastly, it was good to see Dylan Moses feeling comfortable directing traffic and being a leader. 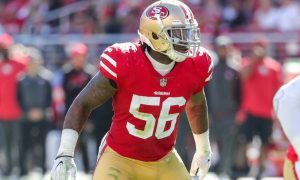 One of the times I watched a replay of the game, I just focused on Moses and he looked in charge for most of the day and it was good to see him continue his “coaching’ on the sidelines when the offense was on the field. Following the game it was good to hear Moses say he felt he had folks on the same page during the game and there was no problems with communication during the game. This had to be music to Nick Saban’s ears too.